Imagine if you were followed around all day by a little man who kept asking you for money. Not with menaces, just a wee fellow who would occasionally stick his head around the door and rattle a collection tin at you. Sometimes he might whisper a brief reminder about your responsibilities and that he could help. Really, he could make them all go away... for a price. Well, thanks to the wonders of modern smartphone technology this entertaining scenario can be yours. All you have to do is download EA's new free-to-play game, Dungeon Keeper and you too can experience a daily shakedown for loose change in the name of retro gaming 'fun'. Dungeon Keeper, you see, is a Free-to-Play game. In the wacky, topsy-turvy world of gaming, this means that it will cost you money and you can't really play it otherwise. Free-to-Play (F2P hereafter, I'm getting annoyed even typing it) is the business model that is killing gaming. Not for games publishers, mind. Just for players. When you download an F2P game you are usually presented with a cut-down or limited version of a game that you can enhance by making in-app purchases. Sometimes these microtransactions just make the game a bit easier (an early example being the level-beating Mighty Eagle from Angry Birds) or more aesthetically pleasing (you might buy a new outfit for a character, say). Increasingly, however, developers are making in-app purchases the only way to ensure that the game is playable. The original Dungeon Keeper was a PC strategy game that put you in the role of a stereotypical Dark Lord who had to stock His dungeon full of monsters and traps to repel any heroes who might come a-callin'. The mobile remake takes that basic template and tries to 'update' it with the same kind of F2P mechanic found in games like Clash Of Clans and Candy Crush - a series of timers that slow gameplay down unless you spend an in-game currency to speed things up again. These in-game currencies (Gems, in the case of Dungeon Keeper) can only be found in short supply in the game proper, meaning you have to top them up with actual, real-life currency to avoid frustration. 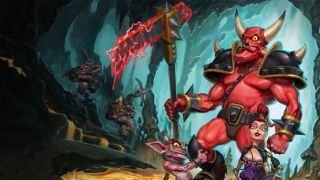 What can be an annoyance in some games has here been turned up to eleven, making Dungeon Keeper less of a game and more a sort of siphon you can attach to the side of your wallet in return for its measly offerings of mobile entertainment. "You can pay out a gem or two to avoid the wait. And you do because, well, who wants to wait?" To build a world-class Dungeon there are certain things that you need to do. You have to dig out spaces to fit special rooms like a Hatchery (to breed chickens, your minion's favourite food) or a Library that you can use to research spells with which to confound your enemies. Helpfully, there are several open areas already visible on the game map that you could use for this, but you still have to dig out corridors through the earth and rock in order to reach them. The problem with this is that almost every action in the game has a timer attached. Summon a demonic helper or a heavily armed Troll to defend your gates and you must wait a short while - a few seconds perhaps, or a few minutes - for it to arrive. You can pay out a gem or two to avoid the wait, though. And you do because, well, who wants to wait? Digging tunnels takes longer depending on the kind of rock your Imp helpers are chipping away at. Just a short while after I began playing properly (having already been charged a fair few gems during the tutorial) I started to dig my way towards a suitable room for a Hatchery when I noticed that the timer for one of the blocks read '1d'. Not one old Penny, one actual day of real-time play. Or I could just pay a few hundred gems to get things moving..